Massimino and Camillo Genetti, probably late 1920’s, photo courtesy of Giovanni Marchetti. I am FaceBook friends with Gemma Genetti. She lives in Merano, a beautiful historical city in northern Italy. Gemma’s roots are from Castelfondo, the ancestral village of the Genetti family. Over the past few years we have kept in touch and were sure we were related. But somehow the link between our families eluded me – until yesterday. I saw a FaceBook comment Gemma made under a photograph of her father and uncle posted in “Chei da Chastelfon,” a private FB group that we both belong to. The group publishes many historical documents and photos of scenes and people from Castelfondo. 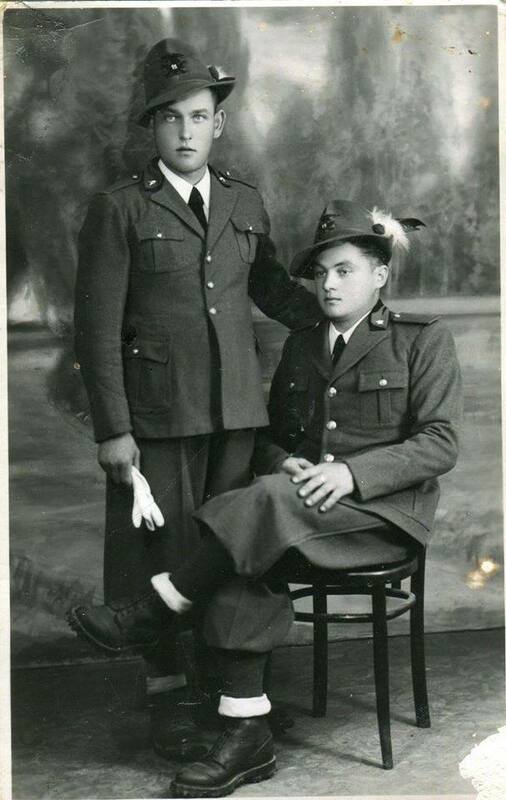 Yesterday I was staring at a portrait posted by the group administrator, Giovanni Marchetti, of Massimino Genetti and his brother Camillo in military uniform. As I translated the comments below the photo, a realization came to me. I might be able to match up the two siblings in the town’s baptismal records. If I could find both siblings, plus their sister Anna (mentioned in one of the comments) I would have the correct ancestors for this family. Since we have many repetitive names on our tree (such as Pietro, Giovanni and Fortunato) this is not always an easy task. But if all of the siblings’ records matched and I had the exact names of their parents and grandparents, I could positively identify the branch of their ancestors. Part of Genetti Family Tree showing Antonio and Veronica Genetti with their six sons. Within an hour I had scanned through pages of Castelfondo records prior to 1925 and found two of the three siblings. The baptismal records had exactly the information I was searching for. I glanced up at the family tree hanging above my desk and immediately saw Gemma’s grandfather, Pietro! Grabbing a piece of paper, I drew a descendant chart for Gemma and another for me – and yes, we shared a set of great-grandparents! Our 3rd great-grandparents, Giovanni Battista Antonio Genetti (1789-1852) and Veronica Paniza (1789-1871) are one in the same. That means my 2nd great-grandfather, Leone Genetti (1826-1909) and Gemma’s 2nd great-grandfather, Francesco Genetti (1818-?) were brothers. After counting down the generations, I concluded Gemma and I are 4th cousins (cugini) from the same branch of the Genetti family. Yea! It’s always exciting to find our genealogical connections and to acknowledge those that came before us. The life paths our families chose were different and yet we have a deep connection through DNA and ancestral heritage. Gemma’s great-grandfather, Fortunato, stayed in Italy. My great-grandfather, Damiano, came to America. 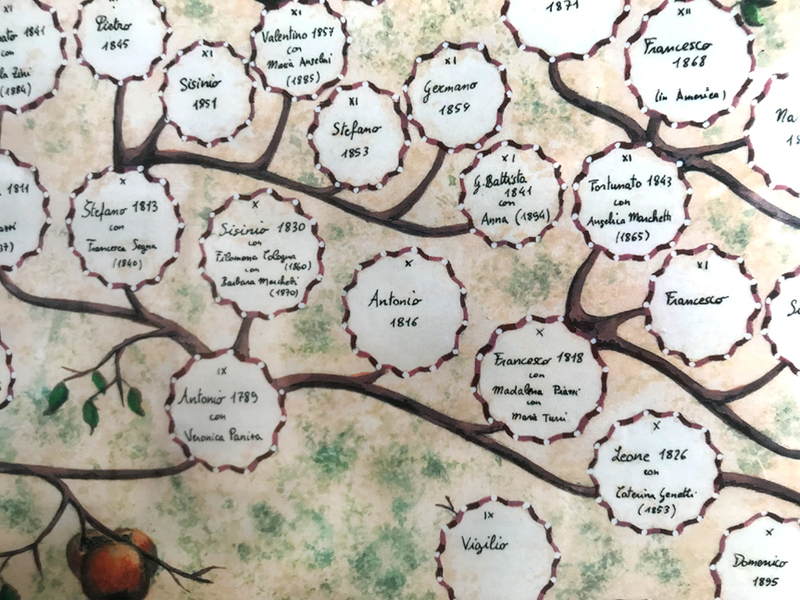 Two different countries, two different families, two different languages – and yet connected six generations in the past. A special hello and thank you (ciao e grazie) to Gemma Genetti, Giovanni Marchetti and all of the wonderful members of Chei da Chastelfon. I have so enjoyed connecting to my Trentino heritage through your posts and photos. ← The Passing of Leon A. Genetti Jr.